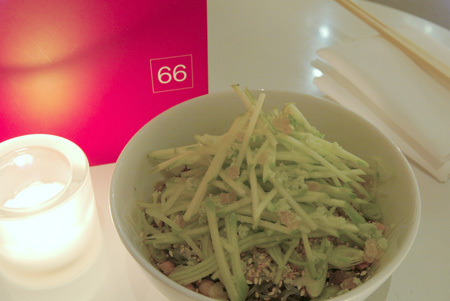 Finally tried Jean-Georges Vongerichten's Chinese restaurant 66 last night. I've been curious to taste JGV's take on Chinese food ever since it opened. I went in with high hopes since I happen to think that for a city so obsessed with Chinese food (and with so many Chinese people), New York sure has a lot of crappy Chinese restaurants. In fact, one of my least favorite things to hear from friends is: "Hey! Let's eat Chinese tonight!" So I was hoping maybe a super chef like Jean-Georges could bring a much needed boost to the sorry state of New York City's Chinese food scene. And no, I'm not bigoted enough to think that only a Chinese person can make great Chinese food. A great chef is what it takes, and if he happens to be Alsatian, then so be it! And for what it's worth, most of the kitchen staff is Chinese (save for a couple of whiteys). What did I think? Short version: Good and competently executed Chinese food. Nothing fusion-y (at least not the dishes I've tried, and no, not being fusion-y is not a bad thing). Way too expensive. You can get the exact same food 5 blocks east for 1/3 the price (and obviously without the Richard Meier interior, which by the way, is nothing special). I'll run through what I ordered. First I had the "Cold Sesame Nooldes '66'" for $6.50. It uses rice vermicelli noodles instead of thicker noodles and there's a gob of peanut butter in there somewhere. I tried to mix it the best I could, but the peanut butter was very hard to distribute evenly. So I ended up with some bites that were really salty from the sauce and some bites that were very peanut-butter-y. Overall, I would say it was pretty good, but not spectacular (a theme that would be repeated throughout the night). 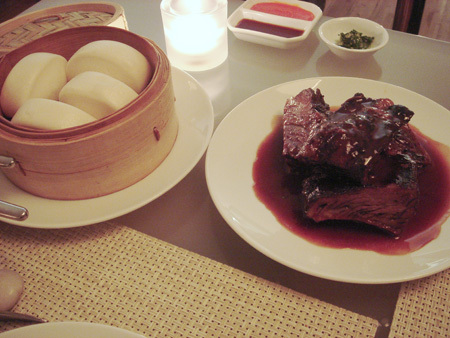 I generally don't like to eat dim sum at night, but I had to order the 叉燒包/bbq pork buns ($7) because I love 叉燒包s and I wanted to taste Jean-Georges' take on it. Maybe it would be 叉燒包-heaven? Alas, it was not. It's okay. Nothing special. 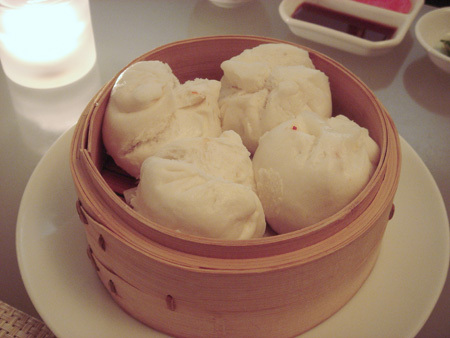 The best 叉燒包s in the city are still the ones from Dim Sum Go Go. Next up was the "Lobster E-Fu Noodles with Green Chili" for $30.00. 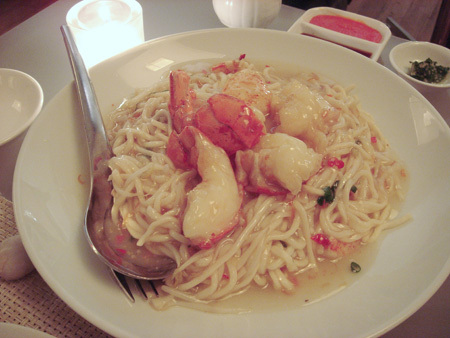 The lobsters were really tough, but the noodles tasted pretty good (easily the best tasting dish of the night). The green chili provided a surprising and welcomed kick to it, but I wished they put in a little more since only about every 3, 4 bites did I taste the chili. Then it was "Beef Shortribs Glazed with Red Wine & Aged Soy" ($22). It came with some small steam buns. The meat was extremely tender, but it was a boring dish. The taste was monotonous. After a couple of bites, I already got tired of it and didn't want anymore. 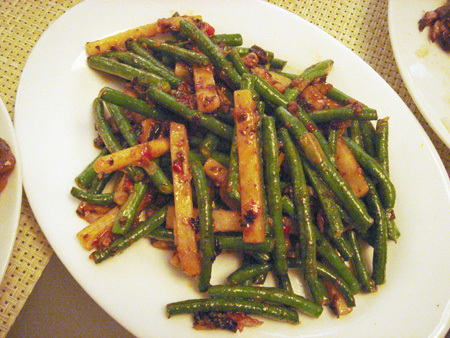 Next up, "Chinese Long Beans with Black Bean Sauce" for $8. Yes, you read that right, only 8 dollars. So cheap! It's basically the same price as Chinese restaurants anywhere. But on the other hand, it tasted basically the same as Chinese restaurants anywhere as well (maybe a little better). Maybe I shouldn't have ordered something with black bean sauce. What did I expect? Black bean sauce is so powerful that anything made with it will taste about the same. But when I was ordering, I was still under the spell of the great Jean-Georges and I thought maybe he can do something special with it. That was our dinner. It was only 2 of us, and we couldn't possibly order more. The dishes were on the big side and we couldn't finish any of the dishes (the fact that they weren't that great didn't help). We also got some desserts (see below), but they were comp'd so they weren't part of the bill. And the bill? It was $105 after tax and tips (the drinks were comp'd too). Holy cow. That's a lot of money for some rather pedestrian Chinese food. I would say the food was worth at most $45. So I'm paying $60 for the Meier ambiance and the Jean-Georges brand name. Ironically, the best part of the meal was the desserts, which weren't Chinese. (And no, it's not because they were free.) 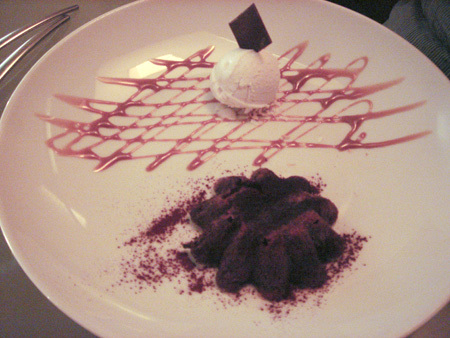 Above is the "Warm Chocolate Cake with Coconut Sorbet". But, really, anything involving warm, moist chocolate cakes would probably be good. So I guess it's nothing special, either. But, man, it was delicious. 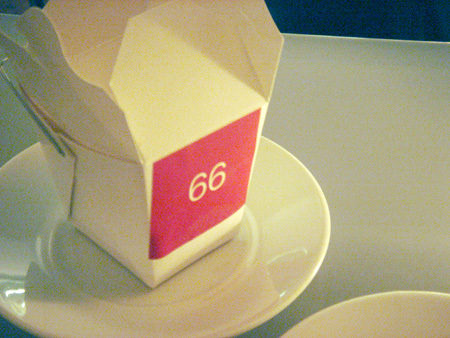 Ice creams are served in little Chinese take-out containers. I forgot what the flavor of the ice cream was. Kind of hard to remember since I didn't order it, it was just given to us. Whatever it was, it was really good. And in case you were wondering why we were comp'd, I was there on a shoot. Even though it wasn't for 66, the manager was nice enough to show us a little love. The bill could easily have been closer to $150 if not for the complimentary drinks and desserts. What an expensive place. Oh, and a non sequitur that's neither here nor there: We sat next to Nicole Miller, who gave me the dirtiest look earlier in the evening when I was shooting and bumped one of my tripod legs near the bottom of her bench seat. Copyright © Liao Yusheng. All rights reserved.